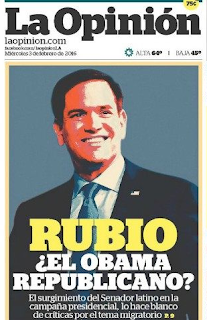 The cover of La Opinión, the nation’s largest daily Spanish-language newspaper: “The Republican Obama? Marco Rubio and Barack Obama share many of the same policy goals, such as Obamatrade and military intervention in Libya, but their most striking similarities are on the subject of immigration. Both men support citizenship for illegal aliens, expanded refugee resettlement, more green cards, more H-1B visas, and large permanent expansions to the rate of immigration and foreign worker importation. Marco Rubio was the co-author of the 2013 Obama-backed immigration bill. Rubio’s immigration bill was endorsed by La Raza, the AFL-CIO, SEIU, Marco Rubio was the co-author of the 2013 Obama-backed immigration bill. Rubio’s immigration bill was endorsed by La Raza, the AFL-CIO, SEIU, Rep. Nancy Pelosi (D-CA), Rep. Luis Gutierrez (D-IL), Sen. Harry Reid (D-NV) , Mark Zuckerberg, and George Soros. Rubio has not renounced his support for a single policy item outlined in the Gang of Eight bill—including his desire to triple green card issuances, double foreign worker visas, and grant citizenship to illegal immigrants.